Trying to get the front fork out of the top triple tree is sometimes difficult and here is a fairly easy removal proceedure. Loosen the top tube nut and spray it with some type of penetrate like PB Blaster. The PB seems to wick itself into the small spaces! Let it soak overnite and spray it once more and let it set for a while. 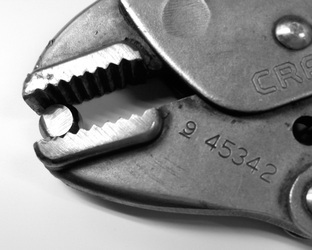 Make sure the top nut is loosened just a few threads. Give the top nut a good whack with with a small sledge with some type of board in between the top nut and the hammer. I used a 2" wide piece of 3/4 " pine. Mine took 2 or 3 whacks to loosen. 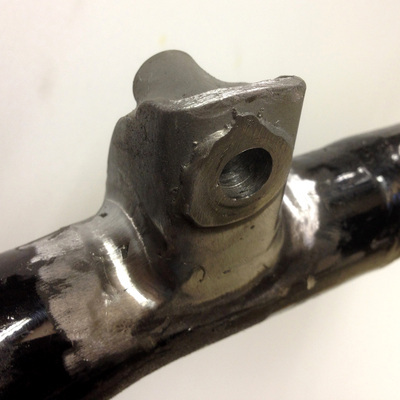 You are trying to loosen the top shock tube which is tapered into the bottom of the top triple tree. Now take off the top nut completely (just be careful as you remove it - it may spring out because the spring might be compressed slightly). 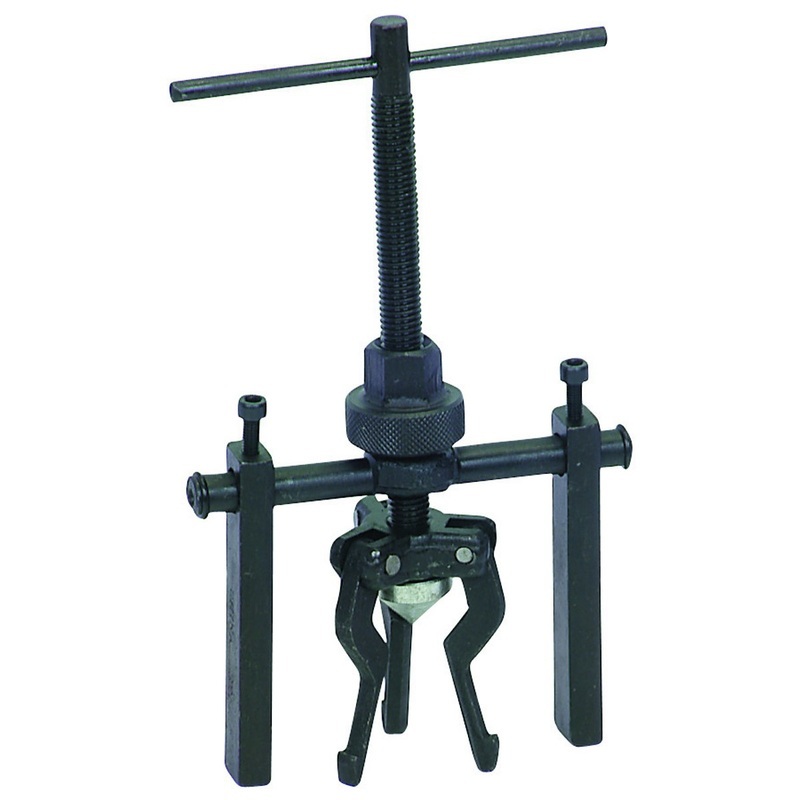 Make sure you loosen the pinch bolts on the bottom triple tree prior to this procedure. 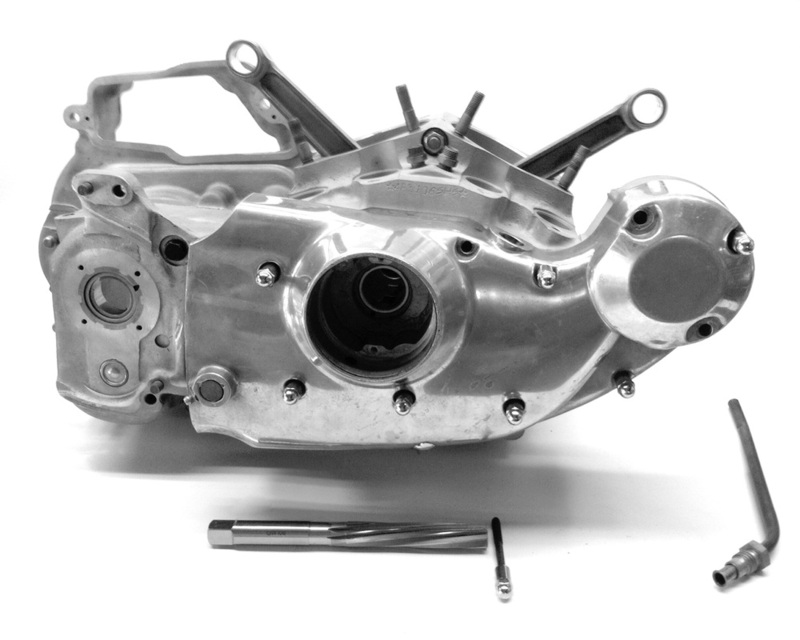 It's easy to make a tool that will hold the clutch basket and the primary flywheel sprocket from turning as you remove the nut. 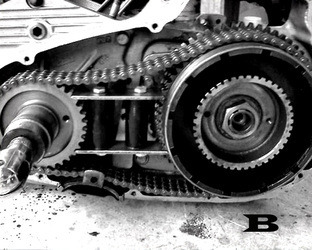 Bolt together and slip between sprockets. See pics below. Click on each photo to enlarge! Just how do you hold the case to remove the flywheel and the clutch basket nuts? Looking at "C" and you will see that I used a 8x8" upright beam that is attached to my garage to hold engine case stationary. I just bolted the case where the generater mounts with 2-1/2 " lag bolts. In "B" you will see that above hand made tool that is wedged in between the primary flywheel sprocket and the clutch basket. 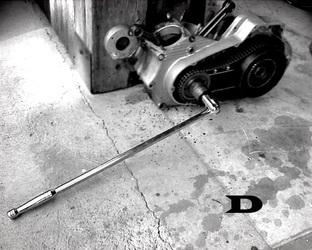 "D" shows an overall shot of a long breaker bar used to remove the front primary nut. Note: the front primary sprocket nut and the rear clutch nut is a standard thread. In other words, turn left to loosen both! 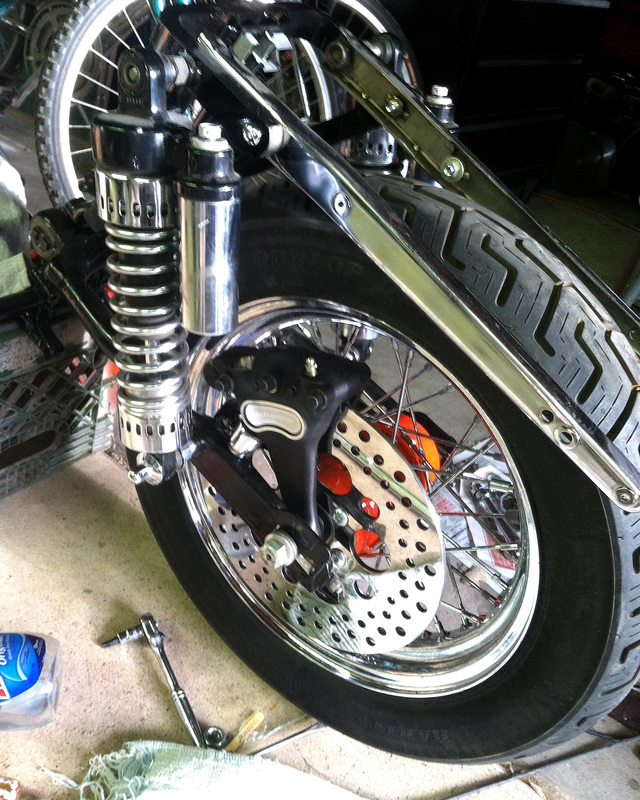 Both sprockets together with the chain needs to be slipped off together. I purchased a new clutch drive and driven clutch plate, installed them into the clutch basket and welded them with a mig welder. 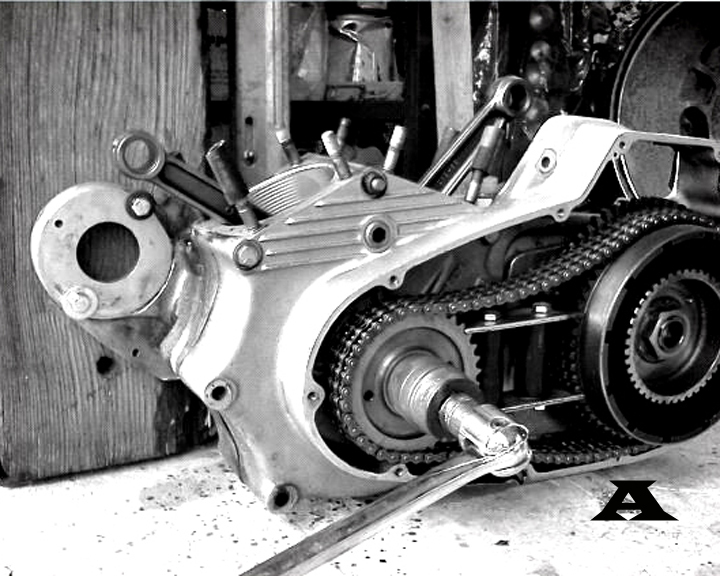 Now with the above tool that is clamped between the front primary and the rear clutch basket in place the everything is held stationary for the removal of either nut. 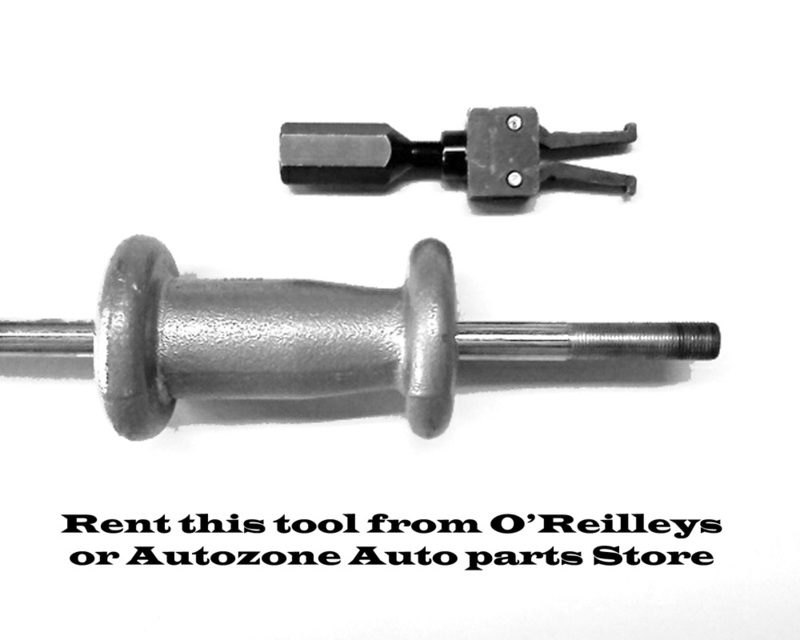 Of course you can get a complete used set and have several clutch tools available for you and your friends. Splitting the case on a ironhead sporty can be a challenge! You do not want to use anything that can mar the case sealing surface so here is what I did to split the case. 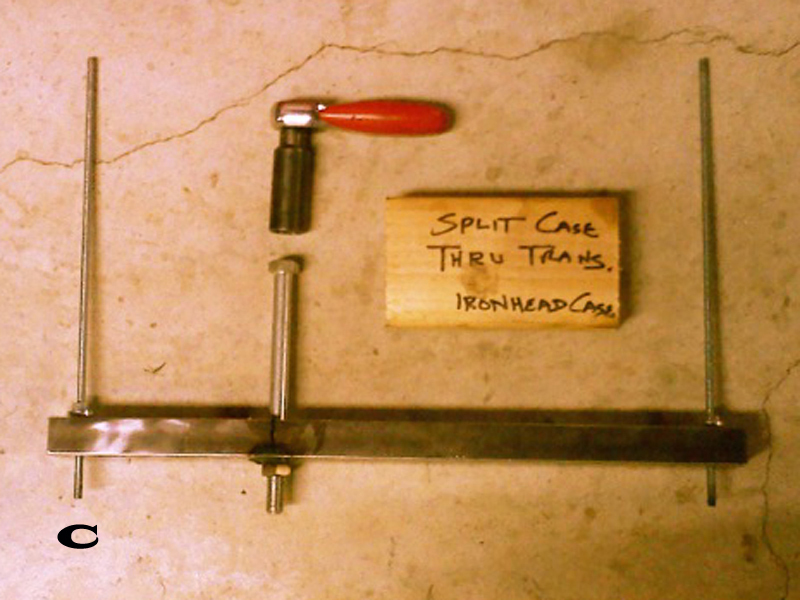 C. Here are the tools used to separate the left and right side cases. and threaded a 1/2 x5 " bolt into the bar. 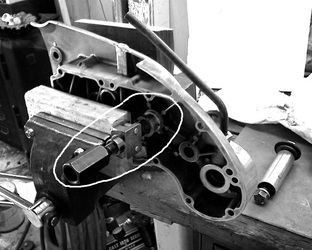 D. Place the clutch removal bar on the primary side and thread the 1/4" allrod into the side of the case, on the ends, to hold the removal bar on. 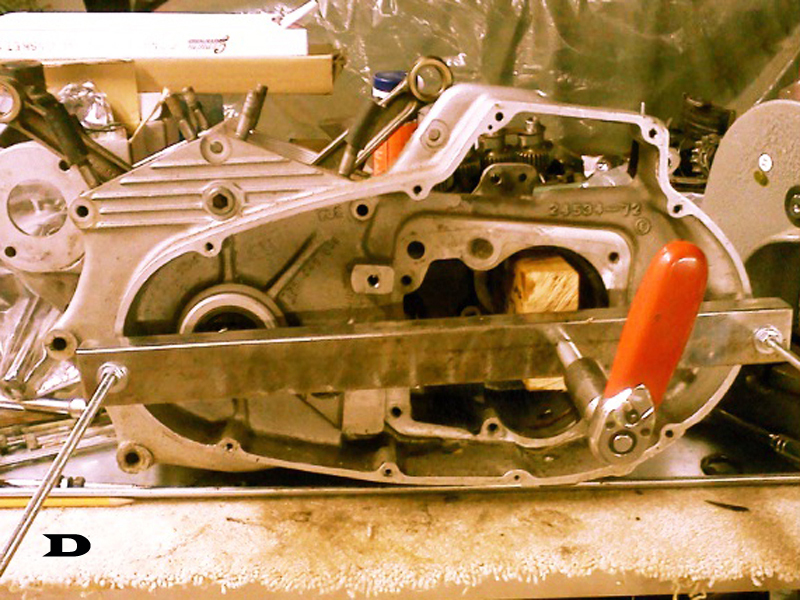 Place the 2x4 wood block into the transmission cavity, thread the 1/2 " bolt into the nut that was welded into the removal bar. Shoot some PB Blaster around the case to aid in case separation. Snug up the 1/2" bolt and watch for the case to start to separate. A couple taps with the rubber handle of a hammer will start to jolt the cases apart. If you find that the cases start to spring back closed you may have a bolt still in the case somewhere. If so, find it and remove it. Proceed with slowly tightening the bolt while coaxing the case to separate with the rubber hammer handle, rawhide mallet or rubber mallet. E. Here's a closeup of the tool. When both cases are about 3/8" - 1/2 " apart turn the cases over with the primary side down and lift the cam side up and off. 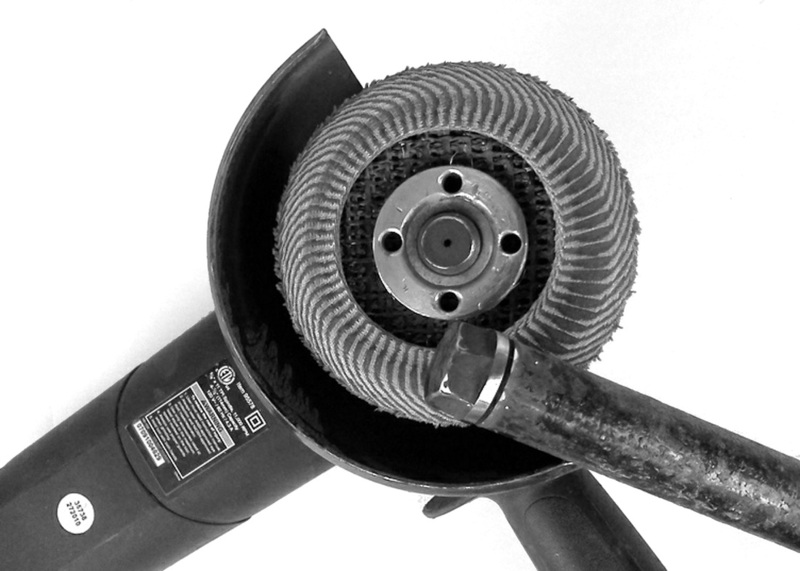 You will now be able to clean and take to your indi for servicing of rod, bearings and flywheel. Bring your bolts with the cases for him to put the cases back together again. Use Yamabond for the case seal! Cleaning the cases prior to rebuilding the bottom is a must. Upon inspection I noticed that there were 2 small cracks in the starter opening. The solution - $60 and done by Chad Nichols of Nichols Fabrication in Tucson and it is good as new. Chad did a great job and just took a couple of days to get back. 520-247-2217 if you need anything welded or fabricated. all is clean good. I have taken the cases and aluminum oxide blasted them on outside and you cannot even tell they were repaired. Next I plan to coat the outside with Eastwoods Extreme Satin Chassis Black and spray some Gyptal on the inside to seal those porus cases and to provide good oil drain down. In this economy its hard to justify replacing items at the Indys prices. So I thought I would go ahead and give it a go to replace my ironhead cam bearings myself. 1. 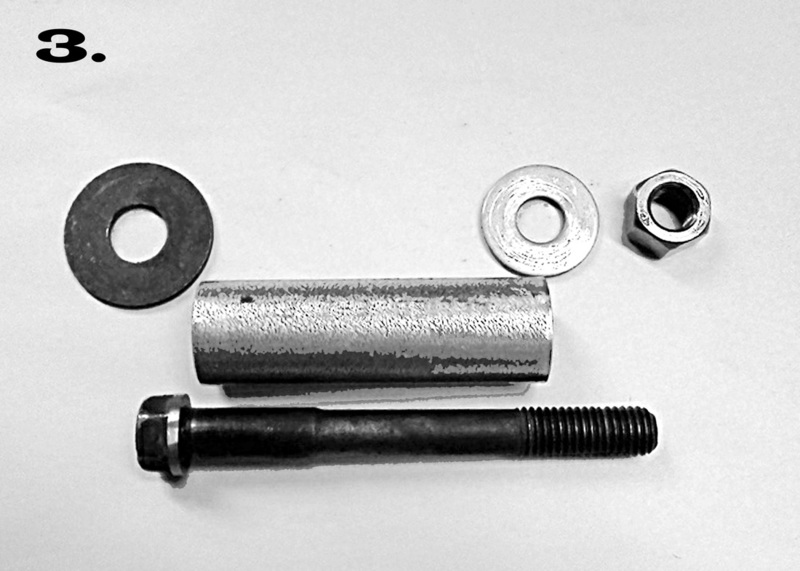 I made a cam bearing removal tool from a 390 Ford headbolt which has a round lip just under the head (see photo left). Since I did not have a lathe to turn a removal tool I made one. From the photo you can see the setup to make the tool. I inserted the bolt into the steel tube, turned on the fiber sanding disk and the bolt just rotated while the disk provided the rotational force to turn down the lip on the bolt . I checked it several times till it just fit into the cam bearing hole. 2. Here is the ford head bolt. I used this because it was long and had a round lip to press on the ironhead cam bearing when installing or removing it. store to get a small section of thinwall conduit, nut and washer for $3.99. 4. 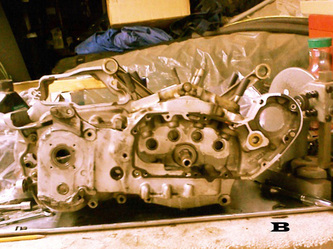 Here is a cam bearing in place showing the installation phase of the cam bearing installation. Center the bearing into the hole side to side. 5. 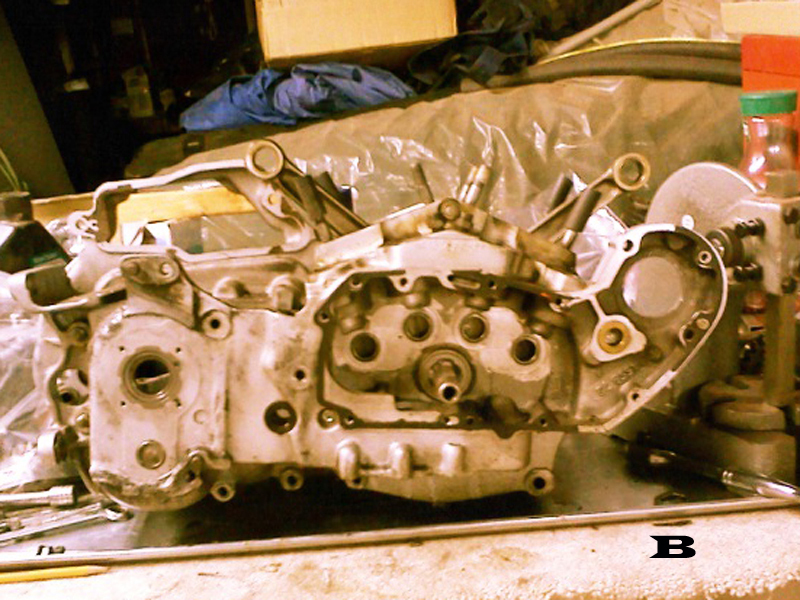 Here is the cam bearing removal photo which is the opposite side of #4. 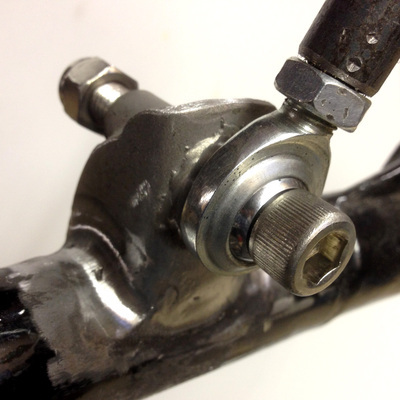 Oil the threads on the removal bolt, put a socket on the opposite side and slowly tighten. The bearing is a good snug fit and should press off without too much force. Note: Upon removal I had a small portion of the outcoming bearing hole breakaway. Upon removal of all the cam bearings I just beveled the lips on both sides of the cam bearing hole and I believe all is well. The cam bearing will sit in the middle of the bearing hole. When installing the cam bearing put your puller part of the tool on the numbered side of the bearing. Look closely at the bearing and you will see that it is thicker on that side than on the unnumbered side. Also have the bearing numbers facing the cams. 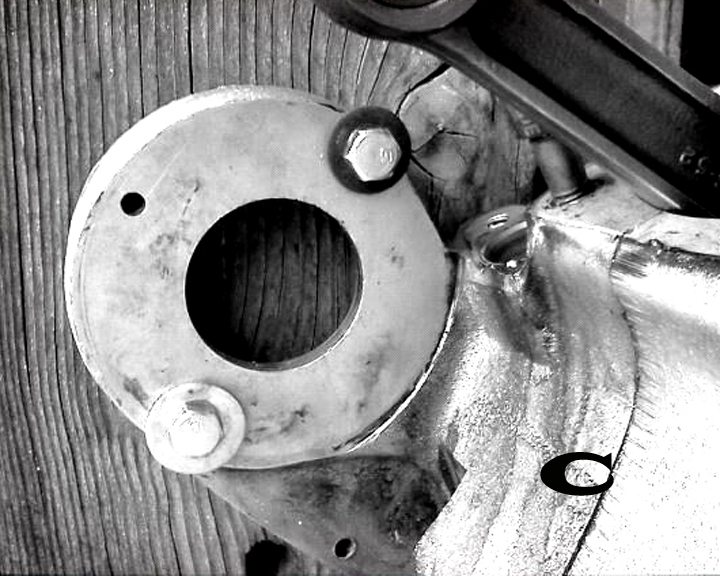 Ironhead Cam Bushing Removal and Replacement just isn't that hard for the mechanically inclined. 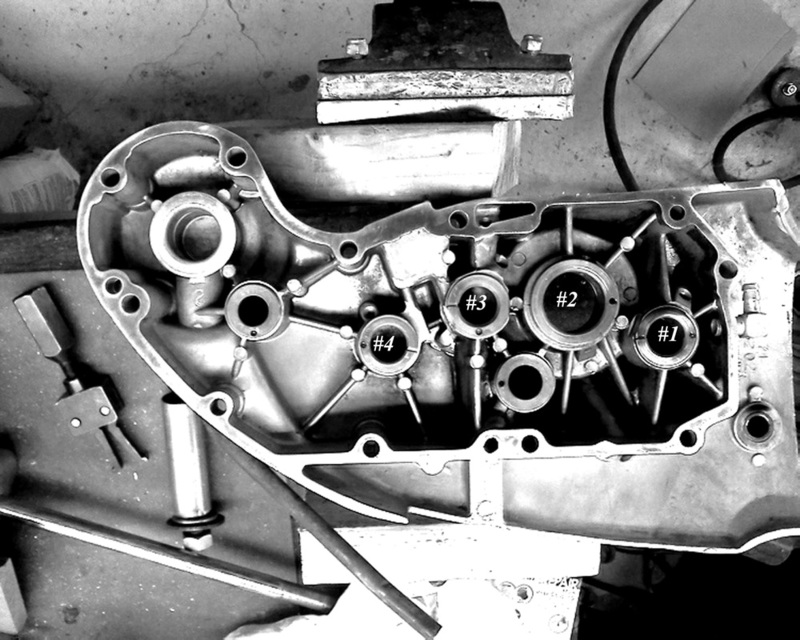 Here is the procedure that I have done with successful results.Note: I plan to do the 3 smaller cam bushings and leave the larger one to my INDI because I do not think that it will be a good financial decision to invest into that large 4th cam bearing reamer. I will probably pull it myself. 1. 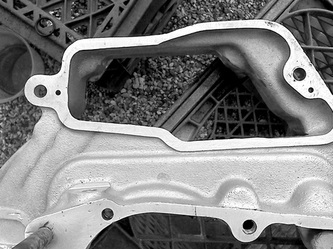 Left shows the right side cam bushing retaining case. 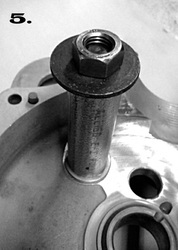 The bearings are marked from the back to the front. I tried to pull one of the bushings and found that it did not budge with the puller that I had. I did not heat the case up yet. So - I put the case into a convection oven that I just bought off Ebay ( and had it modified by adding a sheet metal box to the back to extend it's depth) set at 450 degrees and left it in there for about 20 minutes and then tried it again. Worked this time (use your gloves). You can see the install and removal tool just left of the case. 2. 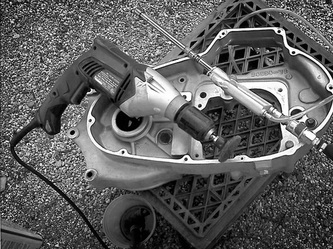 The first tool picture is from Harbor Freight that I did not use but saw it on the XLforum.com. Might get one if these in the future. The second tool picture is from Autozone or O'Reilly's auto store and you can rent for $0. Just put your deposit down and get it back when you return it. 3. Next photo shows the tool from Autozone, in place on the cam cover, that I used to remove the Ironhead Cam Bushings. I am working on a 1975. It is called a pilot bushing remover. 4. 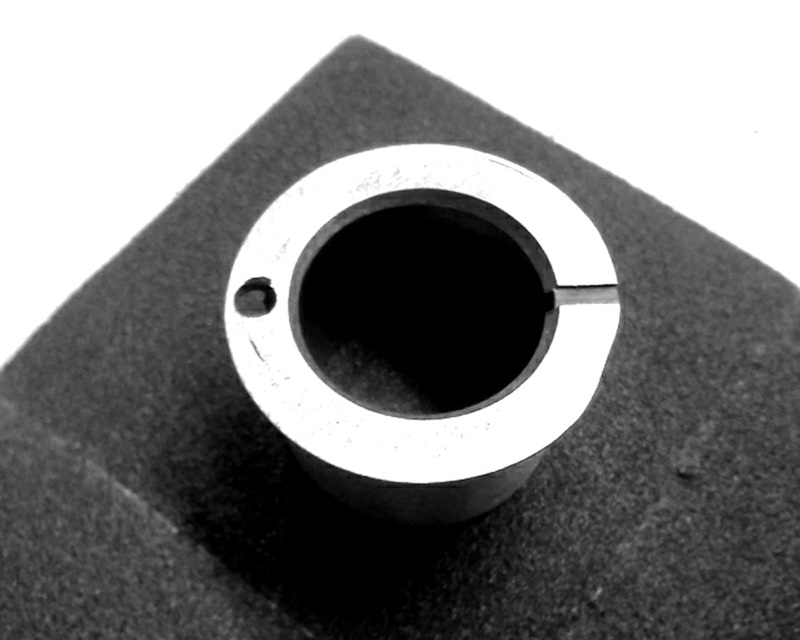 Detail of Cam Bushing Removal Tool which is really a Pilot Bearing Removal Tool. 5. 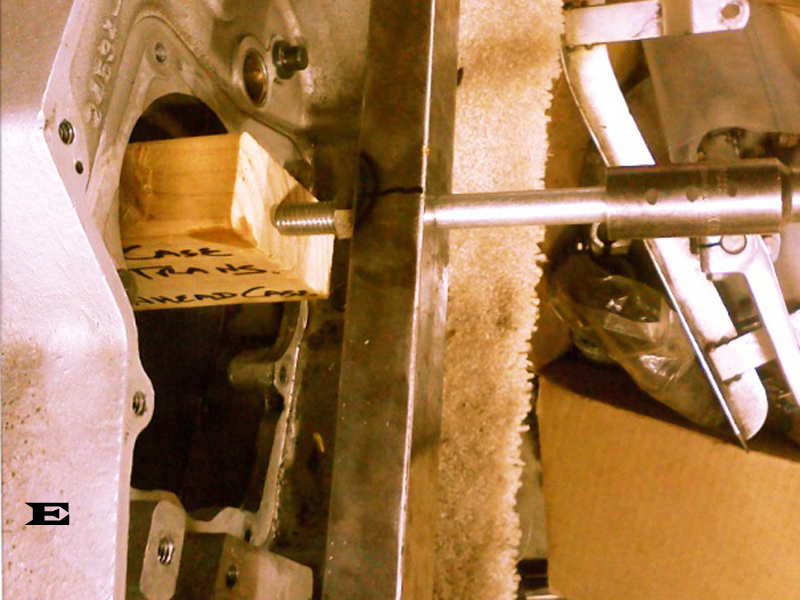 Overall shot of the cam cover in the vise. Notice the 2x4 in the front and the the 1x behind to protect the cover from the jaws. After positioning the cover in the vise (after taking it out of the oven) and placing the pilot bearing removal tool in the bushing and tighten you attach the Slide Hammer into the end of the tool. After a few hits of the slide hammer you now have your old cam bushings in your hand. Replacement will be next - shortly. Waiting for parts to come in. 6. 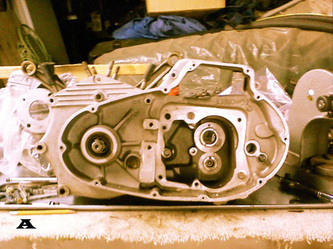 This photos shows the right side engine case with the ironhead 11/16" bushing spiral hand reamer. 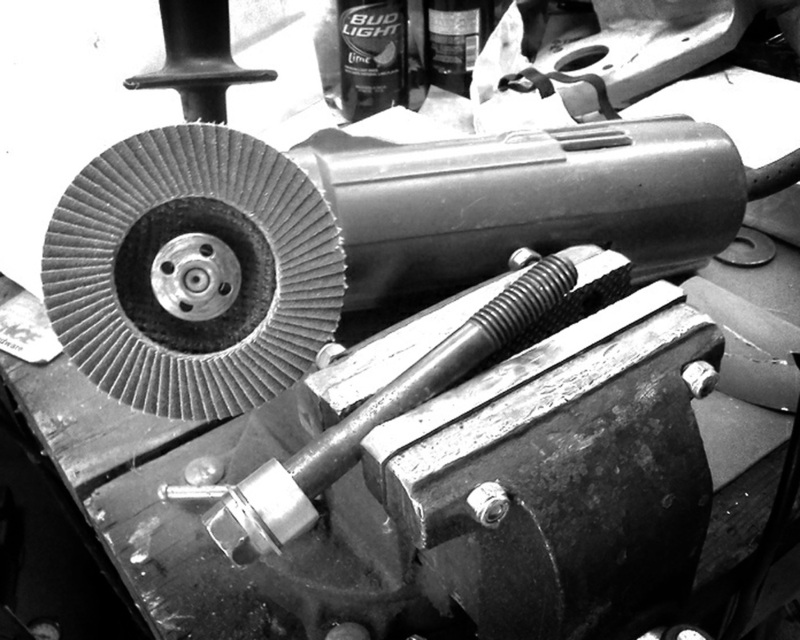 You use a spiral flute hand reamer and not a straight hand reamer or not a chucking reamer (which is used in a drill). The spiral flukes cut the inside of the cam bushing at an angle and will not catch on the grooved oil slot inside the bushing. The reamer is from www.victornet.com and is around $48 with shipping. It is from Poland so quality should be good. 7. 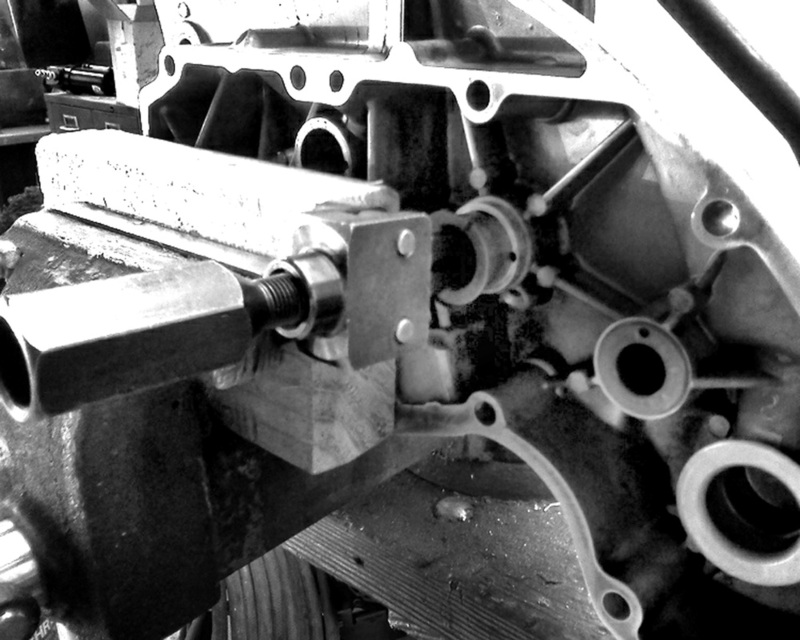 This photo shows the tools used to modify an old cam bushing and use it as a pilot in the right side engine case to center the reamer. Small mini grinder with a 4" new flap disk. 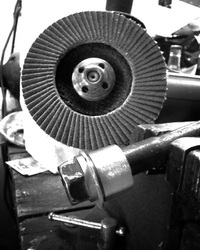 Be sure to use a new flap disk to grind away on your cam bushing. #8. You will notice that I am using the Ford head bolt to modify the old bushing. Just let the old bushing spin on the bolt as you apply light pressure. Check this old bushing frequently for fitment into the right engine case cam bearing holes. Explanation on reaming - after you have all of the cam bushings pressed into the outer case (which I heat the outer case to 350 degrees and place the cam bushing into the freezer, insert bushing and press with a small press. I also add a small amount of red Locktite to the bushing ).I then pin the bushing opposite to where the old pin was. After pinning I run a small dremel tool into the aluminum oil drain hole in each cam bearing to make sure it will drain properly. Mount up the finished camcover with the new gasket and torque in place. Insert the reamer pilot guide that you modified from the old cam bushing and insert the reamer through the engine case side. Using a small wrench, tap T or crescent wrench slowly turn the ream till you feel that it is all the way through the bushing. If you need your bushings replaced contact Bob at 520-298-7007 during the day and he would be glad to quote you. 9. After all of this removal and replacement I think that I have stumbled upon a exciting breakthrough. When you see some galling on the face of the cam bushings you automatically think, "time to change out the cam bushings." 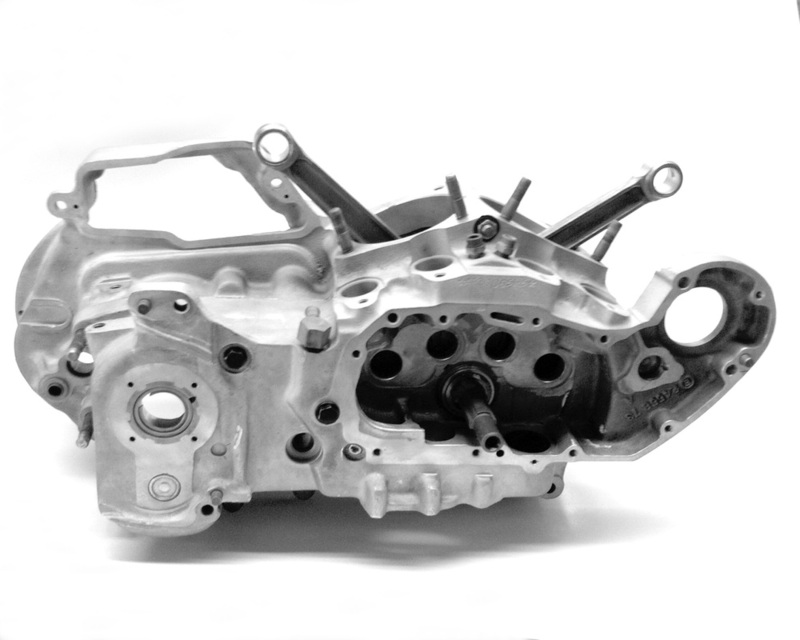 Well, as long as the inside of the cam bushing is tight with the camshaft or within tollerence I am thinking that the end of the cam bushing is so thick that it could be refinished easily. I took the old cam bushing, turned it upside down on its outer face and lightly sanded it on a piece of aluminum oxide sandpaper. Now after I put the old bearings back in and check the cam side clearance I plan to have a machine shop machine a single hardened washer for the fit. So I just got your my back from your Indi and he has just put in a new crank journal, rod bearing, rods and set all of the clearances for the pinion shaft. Here is what I am about to do to ream the new cam bushings that were installed above. 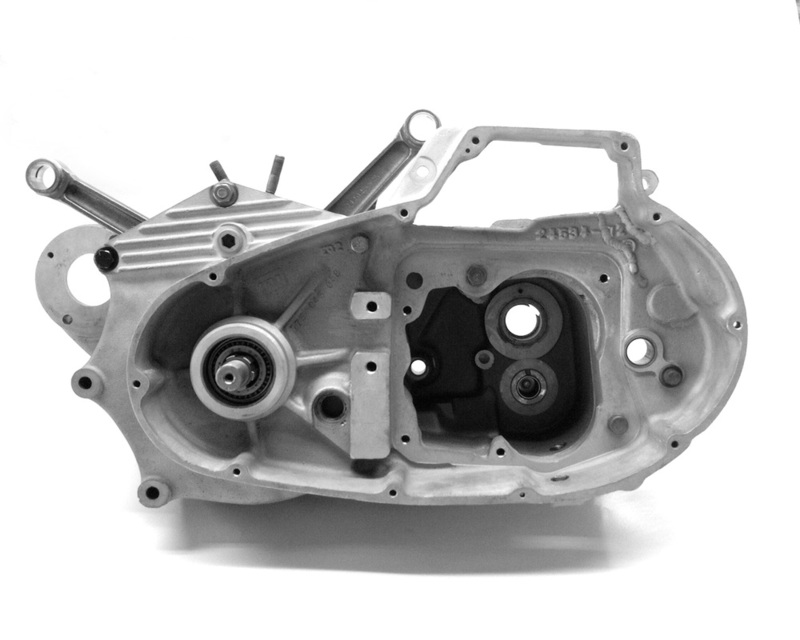 Bolt the right and left engine cases with the flywheel installed – snug up all of the case bolts. Note - leave the case bolt by the oil vent fitting out or you will not be able to take the cases apart when splitting the cases prior to reaming the cam bushings. Install cam cover and snug all of the acorn bolt kit( from Colony Bolts). On the 75’ Ironhead the cam cover is aligned with just one case alignment pin up front near the cover for the generator boss. The other aligning point is end of the pinion shaft. That is it – nothing else to align. 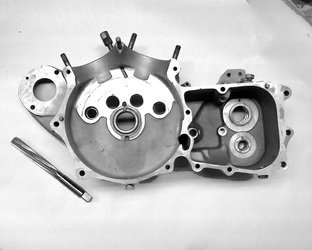 Unbolt the right and left case but leave the cam cover attached). 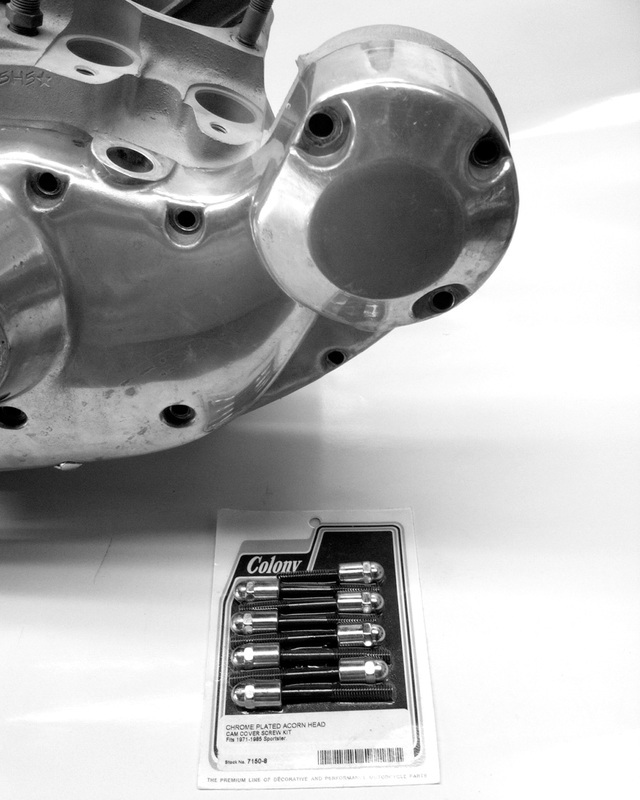 Ream the cam bushings with the 9/16” reamer that you got from www.victornet.com. You will only be reaming the # 1, 3 & 4 cam bushing.As I used the reamer I did the reaming with my fingers because there was no significant material that had to be removed from the bushings. I might of been able to get away with no reaming at all. But since I had the reamer I went a head a did it anyway. Good insurance I guess! Ironhead oil pumps need some help just as do most hi performance auto engines. The arrows point to 2 of the most obvious areas that need attention. 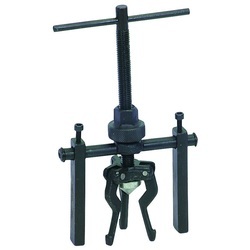 Just get a small ball rotary file, mount it into your air rotary tool and radius the sharp bends. Your done! The oil pump check valve prevents the gravity flow of oil into the crankcase when the engine is not running and provides correct oil pressure for operation of the oil signal light switch. 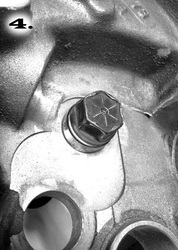 The seat that seals the Oil Pump Check ball sometimes becomes corroded and does not seal tight. Here is a procedure that will seal it up. 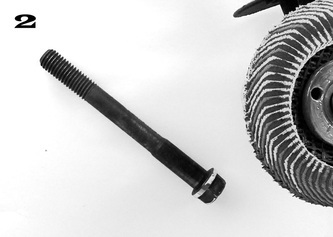 Grind a flat spot on one end of a old check ball (see photo of ball in the vice grip). 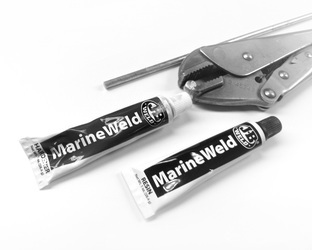 Mix up some JB Weld and attach a small steel rod on the flat spot of the ball. Use some fine valve grinding compound on the end of the ball and insert it into the seat area of the oil pump. Rotate the rod like you are trying to start a fire. Check frequently and clean completely after finished. Click on photos to enlarge.